Fall Commencement will be held at 11 a.m. Dec. 16 in the Art Kamangar Center at the Merced Theatre downtown. 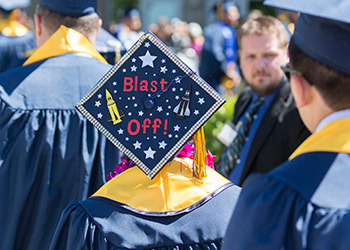 Beginning this year, UC Merced’s fall graduates will have an earlier occasion to celebrate their outstanding accomplishments. 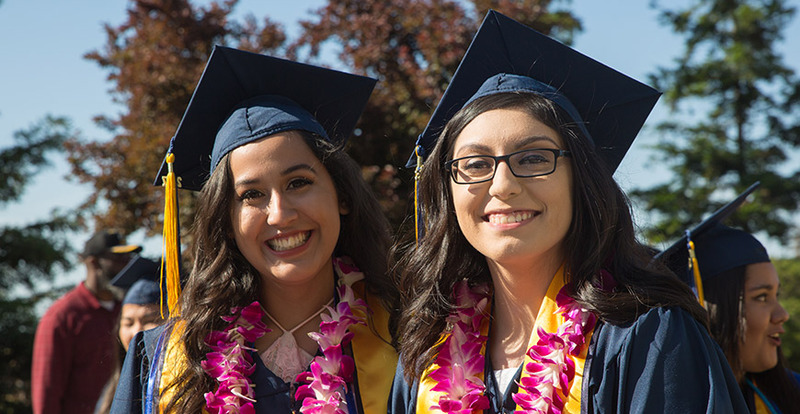 UC Merced is launching a new tradition with its first Fall Commencement. The intimate ceremony, which will be held at 11 a.m. Dec. 16 in the Art Kamangar Center at the historic Merced Theatre downtown, will include all the pomp and circumstance at spring commencement — caps and gowns, full regalia and crossing the stage in front of friends and family. Students have been advocating for an additional ceremony for some time. Ana Le, who graduated last December, worked on the idea for a writing class project in November 2016 with fellow student Chigoziri Ibechem, who graduated in May. The duo interviewed campus and student leadership in order to be thorough. About 300 undergraduate and graduate students are eligible to participate in Fall Commencement. The Associated Students of UC Merced (ASUCM) immediately got on board and the idea gained momentum. Those students who finish their requirements in December traditionally have to wait a whole semester and come back in May to celebrate commencement. This can pose a problem for those who have already started a job, begun graduate school or are traveling abroad. Each student has their own unique path; some graduate a semester earlier while others take longer than expected. Regardless of time, all students work hard for their degree and that hard work deserves to be commemorated. Now, Fall 2017 graduates have the option of participating in the Fall Commencement or in the Spring Commencement in May. Students will not be eligible to participate in both. Fall Commencement is a combined ceremony for all schools and degree levels, whereas Spring Commencement will remain two ceremonies — one for the School of Social Sciences, Humanities and Arts held May 12, and one for the School of Natural Sciences and School of Engineering May 13. The fall ceremony will include a traditional hooding ceremony for Ph.D. candidates. Fall graduates will dress in traditional cap and gown, they will hear from a keynote speaker, and they will cross the stage in front of friends and families as their names are read. Four guest tickets per graduate will be issued, and graduates may submit an appeal for additional tickets. Additional tickets will be granted based on availability. The smaller crowd for Fall Commencement should mean hotel accommodations, parking and restaurant reservations could be easier. The deadline to register for Fall Commencement is Nov. 9, 2017. Once registered, candidates will receive information about a grad fair to be held in early November, where to pick up tickets and other important details. For more information, visit http://commencement.ucmerced.edu or email commencement@ucmerced.edu.